In a blog post about Slumdog Millionaire, Nandan Nilekani alluded to the film's valuable subtext  that it doesn't matter where you come from, only where you are headed. That could serve equally as an epigraph for Nandan's own life. A middle-class kid from a small town, he rose to become a co-founder and co-chairman of Infosys Technologies and a key player in India's growth story. Infosys, the information-technology-services giant, was India's first truly global company, and its core entrepreneurial insight was that spectacular success can be achieved through innovative, ethical and transparent business-management practices. In the process, Nandan, 53, became both a corporate icon and India's brand ambassador. And just as truly successful companies and individuals have the ability to reinvent themselves, Nandan's new avatar is that of a civic-minded intellectual keen to shape public policy. In his book Imagining India (which won him the highest-ever advance for a nonfiction book in India), he offers a "safety net of ideas" on issues ranging from urbanization to environment to take India into a second phase of dramatic, technology-driven growth. "My objective in life is to be an object of change," says Nandan. He proudly claims to belong to the "bridging generation," the one that exists between the India of the old and the new. 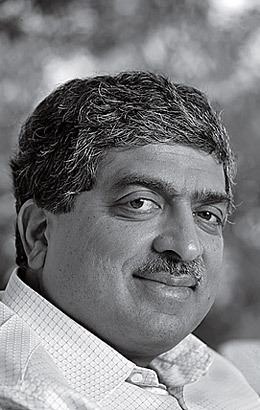 As the new India, fueled by its robust democracy and favorable demographics, seeks to make the transition from a developing nation to a developed one, it will need the vision and talent of people like Nandan Nilekani.